Micro-moments are the latest mobile-driven trend that’s disrupting digital marketing. It is the short span of attention customers spends on mobile devices to buy, search, watch, or locate something. The rise of pocket computers (Smart Phone) changed the consumer's buying behaviour. It just disrupts organized information search and made it more reflexive . 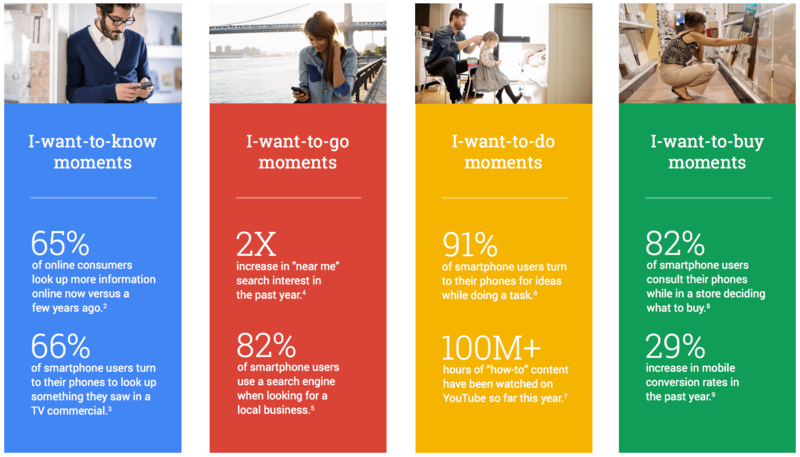 Google coined the term "Micro Moments" for this new pattern. Google content marketing team ( Think with Google ) started publishing data related to different types of Micro Moments of the consumer journey. For marketers, there is a threat and opportunity comes when any change happens in media consumption pattern. Here is "MOBILE" new entrant. Your customers search the web for the specific question. It will pay off you to have the answers and have them quickly. The real time factor of micro-moment is disrupting the rule book of digital marketing, with in-the-moment thing need deep and long-term strategies. The real challenge is, you will have to move from demographic segmentation to highly intent based segmentation and targeting. The Smaller screen is going to give us bigger attention but in shorter blocks. We are moving towards Mobile first world. Google study says that a normal consumer experience several different types of Micro Moments on average 150 times a day. “ Nowadays your customers turn phones with intent and expect you to deliver immediate answers. Google classified it in four key micro-moments where decisions are made and preferences are shaped”. b) I-want-to-go moments: When smartphone user searches customize information eg: near me, in the city, local business etc. d) I-want-to-buy moments: When smartphone user consults his/her phone for deciding what to buy. Today's smartphone user consumers spent average 4.7 hours daily on their phone. This is the point where you have to capture the attention of them. You need to change the approach by not only identifying those micro-moments but creating easy and quick consumable contents to capture those. It is not about how you are doing or how I am doing it but majorly of content is being created in today environment are an interruption. You will have to Ctrl Alt Delete your old practice and shift to mindset, where your whole marketing program will be designed on the fact that you have few second to capture the attention of your target audience. The another problem is we push the consumer to purchase when they are not in buying moment. Your consumer generally goes through different kind of moments and your job is to identify and capture those nanoseconds. Here YOU WIN ! So Now Question is how you can use micro-moment to capture those intent based moments ? Though micro-moment marketing is a new stream but some organization doing it in very effective manner. You can see here how Nike used sports moments for deeper engagement. Nike's Short Brief on 3D Phenomenal Short Campaign. Very smartly Nike utilized the mobile search data. With Google data to understand the major spike in search during sporting events (63 percent of searches during big games happening on mobile devices), They caught the major micro-moment of the sport lovers. They use this insight for creating Nike’s 3-D Phenomenal Shot campaign that showcased the world’s greatest players in moments of unpredictable brilliance. LO'real created the exceptional experience by just capturing make-up moments. During one interview David Edelman (global co-leader of Digital McKinsey ) gave a very great example of Starwood app. By understanding Mobile and Local search trend, Best Western International created simple and seamless experience. Best Western International reimagined its online booking experience by starting where many of its customers do—on their smart phones and tablets. By adopting this mobile first mentality, the company has created a guest experience based on a clean, uncluttered interface that is easy to use and provides the information guests want. Think with Google’s report says smartphone users are not absolutely certain of the specific brand they want to purchase when they begin searching online, and 51% of mobile users have discovered a new company or product when performing a search on their devices. To take advantage of this uncertainty, You must show up. Here is the way you can capture micro-moments for your brand. #1. Identify the Moments: Find out the moments when your consumer performs the search on a mobile device. You can find out some micro-moments through followings..
#2. Understand Moment-based need: You have to understand the need which can fulfill in those discovery moments. Learn about all common questions of your customer and prepare answer of those by keeping the search moment in mind. Your customers generally don't search for keywords, they generally search for questions, prepare answers of all "How-to, What, Why, When" possible types of questions. #3. Create a content to deliver experiences: Creating best content is not just ok. You will have to think the complete experience. A simple and easy to consume content on a mobile device which adds value, gives the best experience. #4. Focus on the whole Journey: After solving the problem of one moment could lead the start of another moment. You will have to keep the thought in mind that if you are capturing the imagination of your consumer for one moment and give best experiences. In the second micro-moment, your consumers will expect from you to be there for them. In a digital age, consumer journey does not end after purchase. Your customers are constantly engaged with you for post-purchase information too. So keep in mind sales is not a final moment. Before or After sale your consumer can have many micro-moments searches. #5. Evaluate all moments which matters: Evaluation is the important part of you micro-moment marketing. Collecting meaningful insight from the customers should be the foundation stone of strategy. Regular evaluation will give you direction. You will be better to understand what is working or what is not. Track, interpret and keep adjusting the dynamic micro-moment marketing. Time to think beyond linear customers journey. You will have to think for quick to consume more personalize moment based contents, which could deliver value to the consumer. The success of brand will depend on If you will be able to deliver seamless experience from micro-moment to micro-moment across the channel and device. You will have to build mobile traffic from the moment by moment. Consumerism has shifted to mobile and you have no option left other than to optimise your marketing program for a mobile first world. It is tough to capture all micro-moments but you can't ignore the reality. It is happening.